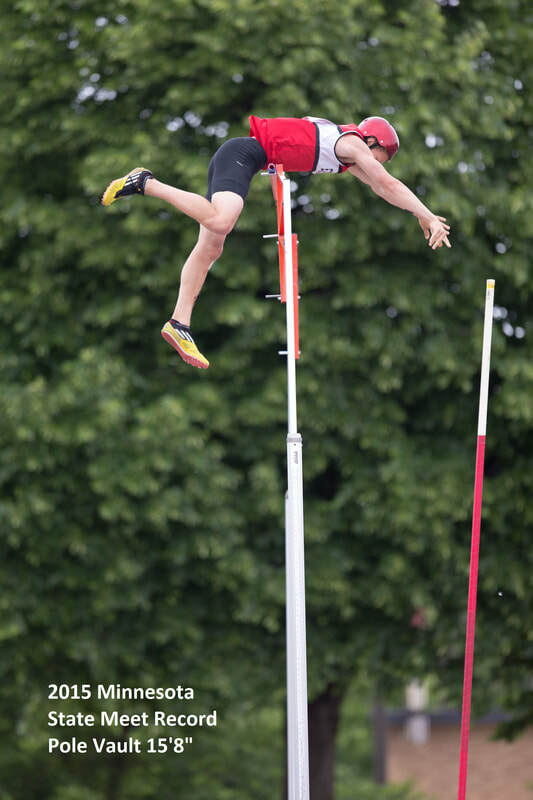 Eden Prairie Pole Vault is a club catering to pole vaulters of all abilities. We are located in Eden Prairie, Minnesota. ​Whether you are just starting out as a beginner or are a state champion, we are here to help you to be your best. We believe the pole vault is a continuous chain of events that needs to be executed properly in the correct order. At our pole vault camps, we will spend a considerable amount of time working to develop the vaulter's technique from the first step to bar clearance in order to maximize their overall performance. Chris has been the pole vault coach at Eden Prairie HS since 2012. Since then, the school records have increased to 15'8"' for the boys and 11'4" for the girls. Prior to Eden Prairie, he coached for 9 years at Armstrong HS. Chris has coached 4 state champions, 20 all state performances, and 27 state qualifiers in the pole vault. Chris coached Ben Ose, the 2015 boys state AA pole vault champion to an all time state meet record of 15'8". He coached Alicia Rue, the 2005 and 2006 girls state AA pole vault champion to an all time state meet record of 12'9", a personal best of 13'3" and the 4th best jump in the nation in 2006. Chris graduated from the University of St. Thomas in 2001 with a BA in computer science. At St. Thomas, Chris was a three-time MIAC conference pole vault champion and placed 2nd three times. Chris attended Minneapolis Washburn HS where he qualified for the state meet twice and was all state his senior year. ​Chris has a personal best of 16'0". He is USATF Level 1 Certified and a USATF Registered Coach. John currently coaches at the College of St. Benedict and St. John's University. In 2017 John coached London Stelten to Indoor and Outdoor All-American honors with a 4th place NCAA finish and PR jump of 3.95m. Prior to coaching at CSB/SJU, John coached the boys at Mounds View HS for six years. John has worked closely with his athletes to produce a Junior Olympic National Champion, 4 youth All-American Performances, 4 All-State Performances (including one runner-up), 2 True Team State Champions, 14 All-Conference Performances, and 14 All-Section Performances. While at Mounds View, his athletes improved the boy's school record to 15'7". In his 3 years coaching the pole vault at Saint John's University and the College of St. Benedict, John has developed 6 All MIAC performances, 6 Honorable Mention Performances, and a 5x MIAC champion. Outside of the pole vault, he has played a major role in the development of 6 All-MIAC performances and 15 Honorable Mention Performances in other events. John graduated from the University of Minnesota where he earned a BA in English and a Master's Degree in Education, and he has also gone on to earn Level 1 and Level 2 - Jumps Coaching Certifications through USA Track and Field. He is also a USTFCCCA and NCAA certified Strength and Conditioning Specialist. Anna is a Eden Prairie HS alumni and a graduate of St. Benedict. Anna was coached by both Chris and John. She started pole vaulting her junior year of HS after running distance. Chris found that she was a gymnast and converted her to a vaulter. Anna went on to become a section champion and all-state her senior year. While in college at St. Bens, Anna was an All-MIAC performer. Anna has a lifetime PR of 11'1" in the pole vault. ​Anna has been coaching PV in the summer while in school and has developed a great eye for what athletes need to do to improve. We are excited to have her join our coaching staff. Alicia is the head coach for the Wayzata girls track & field team and is a math teacher at the high school. She graduated from the University of Minnesota in 2010. Alicia has a personal best in the pole vault of 14'4.5"(4.38m). She is a NCAA D1 4x All American in the pole vault. Alicia was the D1 NCAA indoor runner-up & outdoor 3rd place finisher. Alicia has won many indoor and outdoor Big Ten Pole Vault competitions. After her freshman year of college, she qualified Junior Pan American games in Brazil, where she cleared a personal best to place first and win the gold medal. ​While attending Armstrong High school, Alicia was the 2005 and 2006 Minnesota State AA champion, with a high school personal best of 13'3" which was the 4th best jump in the nation for a high school athlete in 2006. "Success does not come from doing extraordinary things; It comes from doing simple things extraordinarily well."